Primary cardiac liposarcomas, Cardiac computed tomography with electrocardiographic gating, Cardiac surgery. Primary malignant cardiac tumors are extremely rare neoplasms that originate within cardiac structures and display biologically aggressive behavior, only occur with a prevalence of 0.001 to 0.28% , and primary cardiac liposarcoma is an extremely rare tumor which is found in only approximately 1% of primary malignant cardiac tumors [2,3]. Cardiac liposarcoma usually manifests as a large, infiltrating mass and can involve any of the cardiac chambers, great vessels, and pericardium . Here we present a case of primary cardiac liposarcoma with the feature of diffuse growth in left atrium and involvement of mitral valve. A 59 y old man presented with 4 months history of chest pain, lower extremity edema and weight loss. The methods used for diagnosis included chest radiography, transthoracic and transesophageal echocardiography, Magnetic Resonance Imaging (MRI), and Computed Tomography (CT). Laboratory tests and physical examination were unremarkable. Electrocardiography revealed sinus rhythm and incomplete right bundle branch block. Transthoracic echocardiography demonstrated normal ventricular function, left atrial dilution, a heterogeneous mass was discovered in the left atrium and attached to atrial septum, and measuring 4.5 × 2.8 cm, another similar mass was attached to the posterior wall of left atrium and measuring 3.5 × 1.2 cm. The margins of the two masses seemed to be connected with each other. And the two masses were immobile with cardiac cycle (Figure 1). Cardiac CT showed a diffuse irregular low density image can be seen in the left atrium with two parts of obvious filling defects attached to atrial septum and the posterior wall of left atrium respectively. The posterior leaflet seems thickened compared to the normal (Figure 2). The patient was evaluated by the cardiovascular surgery service for tumor excision. The preoperative coronary angiogram was normal. 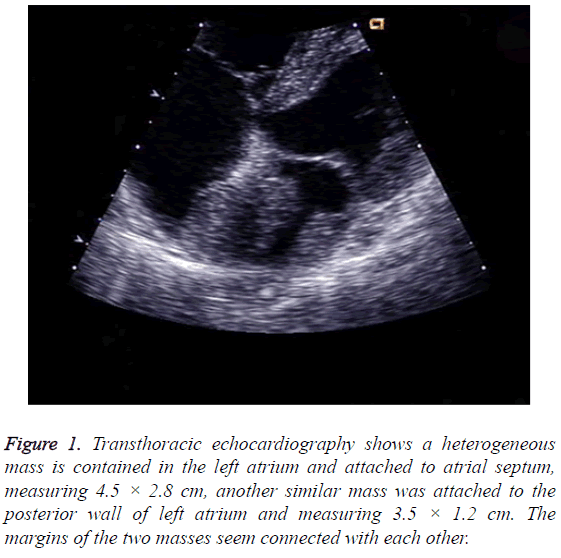 Figure 1: Transthoracic echocardiography shows a heterogeneous mass is contained in the left atrium and attached to atrial septum, measuring 4.5 × 2.8 cm, another similar mass was attached to the posterior wall of left atrium and measuring 3.5 × 1.2 cm. The margins of the two masses seem connected with each other. 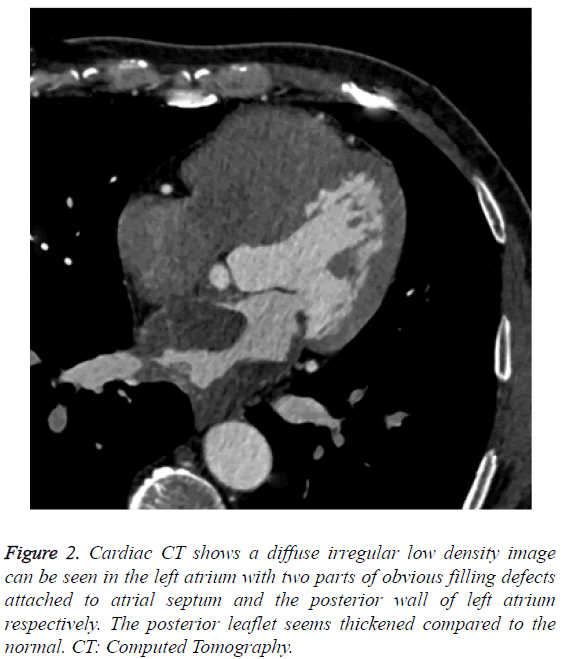 Figure 2: Cardiac CT shows a diffuse irregular low density image can be seen in the left atrium with two parts of obvious filling defects attached to atrial septum and the posterior wall of left atrium respectively. The posterior leaflet seems thickened compared to the normal. CT: Computed Tomography. A standard median sternotomy incision is performed. The aorta was cannulated. Separate cannulas are placed in the superior vena cava and inferior vena cava. After full heparinization, Cardiopulmonary Bypass (CPB) was routinely applied, the aorta was cross-clamped and cold cardioplegic solution was instilled via the aortic root to arrest the heart. Upon the opening of the left atrium by a bi-atrial, transseptal incision, we observed that the whole atrium was invaded and infiltrated by the tumor, the entire posterior mitral leaflet, part of anterior mitral leaflet and the orifices of bilateral pulmonary veins were also infiltrated by the tumor. According to the character of the mass, we considered it to be heart sarcoma and complete resection could not be achieved. After completely resection of the leaflets and chordae tendineae of mitral valve, we excised part of the left atrium that was infiltrated by the tumor as completely as possible without destroying the full-thickness of left atrium. Mechanical heart valve (size 27) replacement was executed in the end. As expected, the heart was beating in sinus rhythm. After careful hemostasis and closing the wound in layers, the patient was carefully transferred to the Intensive Care Unit (ICU) in stable condition. Immunohistochemically, these cells were positive for SMA, Vim, CD117 and partial positive for Ki-67, CD34, S100, Dog-1, Des and D240, but negative for CK and EMA. Histology confirmed the diagnosis of liposarcoma. The patient recovered without complications and was discharged to home on postoperative d 7 with recommendation for follow-up. But the patient died at six months after surgery because of recurrence. Liposrcoma is the second most common soft tissue sarcoma in adults, occurring predominantly in the lower limbs and retroperitoneum. The heart is an unusual location for liposarcoma, and only a handful of cases of primary or metastatic cardiac liposarcoma have been reported in the literature. Liposarcomas are often asymptomatic and may reach a considerable size before causing any symptoms related to direct invasion or compression of other thoracic organs. Therefore, the diagnosis is difficult clinically. Noninvasive imaging plays a critical role in the diagnosis and surgical planning of cardiac masses . Echocardiography remains the first-line for cardiac mass evaluation, however, it is sometimes difficult to assess precisely the extent of a tumour mass because of the relatively narrow window of the echocardiographic examination or because of variation in image quality. Cardiac MR is often the preferred imaging modality for cardiac masses, but it’s main disadvantage is susceptibility to motion artifact [6,7]. With the technological development of MDCT scanners with retrospective ECG gating, cardiac CT is an alternative imaging modality to assess cardiac masses. In our case, cardiac CT provided accurate assessment of size, location, depth of infiltration and lesion margins of cardiac liposarcoma. We recommend the use of CT for the evaluation of size, quantity, location, morphology, tissue characteristics, and clinical correlation of cardiac masses. Although the diagnostic techniques are moving quickly, the imaging characteristics of primary cardiac liposarcomas were inconclusive. This malignancy usually manifest as a large, infiltrating mass and tend to arise in one of the atria, but have also been discovered in the both ventricles and in the pericardium . Pericardial involvement may take the form of effusion, tumor nodules, or irregular masses. There have been several reports which involve the pericardium as effusion, tumor nodules or an irregular mass arising primarily in the pericardium [9,10]. In our case, the cardiac liposarcoma was characterized by an invasive and infiltrating growth rather than exophytic growth which take the form of a large mass. What is more, the entire posterior mitral leaflet, part of anterior mitral leaflet and the orifices of bilateral pulmonary veins were also invaded by the tumor. This is a very rare occurrence. Very few data are available for the most appropriate management of cardiac sarcomas. Evidence shows that the outcome is generally poor, especially in aggressive tumors that are characterized by infiltrative growth. Total surgical resection is rarely of benefit for malignant cardiac tumors [11,12]. However, complete surgical resection was usually considered to be impossible because of the extent of invasion of the tumor into surrounding tissues. Partial surgical resection of the tumor often was performed for diagnosis and palliation of symptoms under these circumstances. However, partial surgical resection may portend a worse prognosis. Just like our case, the sarcoma had already invaded the whole left atrium, complete surgical resection and reconstruction was hard to perform. Hence, our patient was alive only six months after surgery. In conclusion, primary cardiac liposarcomas are extremely rare, therefore, there are no guidelines to diagnosis and treatment. Cardiac CT with Electrocardiographic (ECG) gating can provide useful and accurate anatomic and functional information for guiding treatment. The aggressive tumors and partial surgical resection may portend a worse prognosis and finding a more effective therapy poses a big challenge for the doctors. Hudzik B, Miszalski-Jamka K, Glowacki J, Lekston A, Gierlotka M. Malignant tumors of the heart. Cancer Epidemiol 2015; 39: 665-672. Pacini D, Careddu L, Pantaleo A, Parolari A, Leone O. Primary malignant tumors of the heart: Outcomes of the surgical treatment. Asian Cardiovasc Thorac Ann 2015; 23: 645-651. Neragi-Miandoab S, Kim J, Vlahakes GJ. Malignant tumours of the heart: a review of tumour type, diagnosis and therapy. Clin Oncol (R Coll Radiol) 2007; 19: 748-756. Grebenc ML, Ml RDC, Burke AP. Primary cardiac and pericardial neoplasms: radiologic-pathologic correlation. Radiograph Rev Publ Radiol Soc North Am Inc. 2000; 20: 1073. Kassop D, Donovan MS, Cheezum MK, Nguyen BT, Gambill NB. Cardiac masses on cardiac CT: a review. Curr Cardiovasc Imaging Rep 2014; 7: 9281. Lestuzzi C, De Paoli A, Baresic T, Miolo G, Buonadonna A. Malignant cardiac tumors: diagnosis and treatment. Future Cardiol 2015; 11: 485-500. Auger D, Pressacco J, Marcotte F, Tremblay A, Dore A, Ducharme A. Cardiac masses: An integrative approach using echocardiography and other imaging modalities. Heart 2011; 97: 1101-1109. Sandoval E, Quintana E, Ninot S, Castellá M. Myxoid liposarcoma: an unusual primary cardiac tumour. Eur J Cardiothorac Surg 2012; 42: 379. Lococo F, Cesario A, Meacci E, Vita LM, Porziella V. Huge primary pericardial liposarcoma. Thorac Cardiovasc Surg 2011; 59: 172-173. Wang JG, Wei ZM, Liu H, Li YJ. Primary pleomorphic liposarcoma of pericardium. Interact Cardiovasc Thorac Surg 2010; 11: 325-327. Ramlawi B, Leja MJ, Abu SW, Al JO, Benjamin R, Ravi V, Shapira OM, Blackmon SH, Bruckner BA, Reardon MJ. Surgical treatment of primary cardiac sarcomas: Review of a Single-Institution experience. Ann Thorac Surg 2016; 101: 698-702. Wu TP, Zhou F, DeAnda A, Melamed J, Lim RP. Surgical management of cardiac liposarcomas. J Card Surg 2012; 27: 192-195.